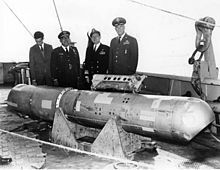 The B28RI nuclear bomb, recovered from 2,850 feet (870 m) of water, on the deck of the USS Petrel. Of the four Mk28-type hydrogen bombs the B-52G carried, three were found on land near the small fishing village of Palomares in the municipality of Cuevas del Almanzora, Almería, Spain. The non-nuclear explosives in two of the weapons detonated upon impact with the ground, resulting in the contamination of a 0.77-square-mile (2 km2) area by plutonium. The fourth, which fell into the Mediterranean Sea, was recovered intact after a ​2 1⁄2-month-long search. The B-52G began its mission from Seymour Johnson Air Force Base, North Carolina, carrying four type B28RI hydrogen bombs on a Cold War airborne alert mission named Operation Chrome Dome. The flight plan took the aircraft east across the Atlantic Ocean and Mediterranean Sea towards the European borders of the Soviet Union before returning home. The lengthy flight required two mid-air refuelings over Spain. We came in behind the tanker, and we were a little bit fast, and we started to overrun him a little bit. There is a procedure they have in refueling where if the boom operator feels that you're getting too close and it's a dangerous situation, he will call, "Break away, break away, break away." There was no call for a break away, so we didn't see anything dangerous about the situation. But all of a sudden, all hell seemed to break loose. The planes collided, with the nozzle of the refueling boom striking the top of the B-52 fuselage, breaking a longeron and snapping off the left wing, which resulted in an explosion that was witnessed by a second B-52 about a mile away. All four men on the KC-135 and three of the seven men on the bomber were killed. Those killed in the tanker were boom operator Master sergeant Lloyd Potolicchio, pilot Major Emil J. Chapla, copilot Captain Paul R. Lane, and navigator Captain Leo E. Simmons. On board the bomber, navigator First Lieutenant Steven G. Montanus, electronic warfare officer First Lieutenant George J. Glessner, and gunner Technical Sergeant Ronald P. Snyder were killed. Montanus was seated on the lower deck of the main cockpit and was able to eject from the plane, but his parachute never opened. Glessner and Snyder were on the upper deck, near the point where the refueling boom struck the fuselage, and were not able to eject. Four of the seven crew members of the bomber managed to parachute to safety: additional pilot Major Messinger, aircraft commander Captain Charles F. Wendorf, copilot First Lieutenant Michael J. Rooney and radar-navigator Captain Ivens Buchanan. Buchanan received burns from the explosion and was unable to separate himself from his ejection seat, but he was nevertheless able to open his parachute, and he survived the impact with the ground. The other three surviving crew members landed safely several miles out to sea. The Palomares residents carried Buchanan to a local clinic, while Wendorf and Rooney were picked up at sea by the fishing boat Dorita. The last to be rescued was Messinger, who spent 45 minutes in the water before he was brought aboard the fishing boat Agustin y Rosa by Francisco Simó Orts. All three men who landed in the sea were taken to a hospital in Águilas. The aircraft and hydrogen bombs fell to earth near the fishing village of Palomares. This settlement is part of Cuevas del Almanzora municipality, in the Almeria province of Andalucía, Spain. Three of the weapons were located on land within 24 hours of the accident—the conventional explosives in two had exploded on impact, spreading radioactive contamination, while a third was found relatively intact in a riverbed. The fourth weapon could not be found despite an intensive search of the area—the only part that was recovered was the parachute tail plate, leading searchers to postulate that the weapon's parachute had deployed, and that the wind had carried it out to sea. During early stages of recovery after the accident the 66th Tactical Reconnaissance Wing, flying RF-101C Voodoos out of RAF Upper Heyford near Oxford, England, provided aerial photographs to assist in the recovery operation and to document the crash site. On 22 January, the Air Force contacted the U.S. Navy for assistance. The Navy convened a Technical Advisory Group (TAG), chaired by Rear Admiral L. V. Swanson with Dr. John P. Craven and Captain Willard Franklyn Searle, to identify resources and skilled personnel that needed to be moved to Spain. The search for the fourth bomb was carried out by means of a novel mathematical method, Bayesian search theory, led by Dr. Craven. This method assigns probabilities to individual map grid squares, then updates these as the search progresses. Initial probability input is required for the grid squares, and these probabilities made use of the fact that a local fisherman, Francisco Simó Orts, popularly known since then as "Paco el de la bomba ("Bomb Paco" or "Bomb Frankie"), witnessed the bomb entering the water at a certain location. Orts was hired by the U.S. Air Force to assist in the search operation. USNS Lt. George W. G. Boyce, removed radioactive contaminated soil from Spain. Additionally, the aircraft carrier USS Forrestal and various other units of the Sixth Fleet made a brief stopover at Palomares on the morning of March 15, 1966, with Forrestal anchoring at 09:03 and departing at 12:19. The recovery operation was led by Supervisor of Salvage, Capt Searle. Hoist, Petrel and Tringa brought 150 qualified divers who searched to 120 feet (37 m) with compressed air, to 210 feet (64 m) with mixed gas, and to 350 feet (110 m) with hard-hat rigs; but the bomb lay in an uncharted area of the Rio Almanzora canyon on a 70-degree slope at a depth of 2,550 feet (780 m). After a search that continued for 80 days following the crash, the bomb was located by the DSV Alvin on 17 March, but was dropped and temporarily lost when the Navy attempted to bring it to the surface. After the loss of the recovered bomb the ship's positions were fixed by Decca HI-FIX position-locating equipment for subsequent recovery attempts. Alvin located the bomb again on 2 April, this time at a depth of 2,900 feet (880 m). On 7 April, an unmanned torpedo recovery vehicle, CURV-I, became entangled in the weapon's parachute while attempting to attach a line to it. A decision was made to raise CURV and the weapon together to a depth of 100 feet (30 m), where divers attached cables to them. The bomb was brought to the surface by USS Petrel. The USS Cascade was diverted from its Naples destination and stayed on scene until recovery and took the bomb back to the United States. It is customary maritime law that the person who identifies the location of a ship to be salved has the right to a salvage award if that identification leads to a successful recovery. The amount is nominal, usually 1 or 2 percent, sometimes a bit more, of the intrinsic value to the owner of the thing salved. But the thing salved off Palomares was a hydrogen bomb, the same bomb valued by no less an authority than the Secretary of Defense at $2 billion—each percent of which is, of course, $20 million. The Air Force settled out of court for an undisclosed sum. In later years, Simó was heard to complain that the Americans had promised him financial compensation and had not kept that promise. At 10:40 UTC, the accident was reported at the Command Post of the Sixteenth Air Force, and it was confirmed at 11:22. The commander of the U.S. Air Force at Torrejón Air Base, Spain, Major General Delmar E. Wilson, immediately traveled to the scene of the accident with a Disaster Control Team. Further Air Force personnel were dispatched later the same day, including nuclear experts from U.S. government laboratories. The first weapon to be discovered was found nearly intact. However, the conventional explosives from the other two bombs that fell on land detonated without setting off a nuclear explosion (akin to a dirty bomb explosion). This ignited the pyrophoric plutonium, producing a cloud that was dispersed by a 30-knot (56 km/h; 35 mph) wind. A total of 260 ha (2.6 square kilometres (1.0 sq mi)) was contaminated with radioactive material. This included residential areas, farmland (especially tomato farms) and woods. To defuse alarm of contamination, on 8 March the Spanish minister for information and tourism Manuel Fraga Iribarne and the United States ambassador Angier Biddle Duke swam on nearby beaches in front of press. First the ambassador and some companions swam at Mojácar — a resort 15 km (9 mi) away — and then Duke and Fraga swam at the Quitapellejos beach in Palomares. Despite the cost and number of personnel involved in the cleanup, forty years later there remained traces of the contamination. Snails have been observed with unusual levels of radioactivity. Additional tracts of land have also been appropriated for testing and further cleanup. However, no indication of health issues has been discovered among the local population in Palomares. President Lyndon B. Johnson was first apprised of the situation in his morning briefing the same day as the accident. He was told that the 16th Nuclear Disaster Team had been sent to investigate, per the standard procedures for this type of accident. News stories related to the crash began to appear the following day, and it achieved front page status in both the New York Times and Washington Post on 20 January. Reporters sent to the accident scene covered angry demonstrations by the local residents. On 4 February, an underground Communist organization successfully initiated a protest by 600 people in front of the U.S. Embassy in Spain. The Duchess of Medina Sidonia, Luisa Isabel Álvarez de Toledo (known as the "Red Duchess" for her socialist activism), eventually received a 13-month prison sentence for leading an illegal protest. Four days after the accident, the Spanish government stated that "the Palomares incident was evidence of the dangers created by NATO's use of the Gibraltar airstrip", announcing that NATO aircraft would no longer be permitted to fly over Spanish territory either to or from Gibraltar. On 25 January, as a diplomatic concession, the U.S. announced that it would no longer fly over Spain with nuclear weapons, and on 29 January the Spanish government formally banned U.S. flights over its territory that carried such weapons. This caused other nations hosting U.S. forces to review their policies, with the Philippine Foreign Secretary Narciso Ramos calling for a new treaty to restrict the operation of U.S. military aircraft in Filipino airspace. Palomares, and the Thule Air Base B-52 crash involving nuclear weapons two years later in Greenland, made Operation Chrome Dome politically untenable, leading the U.S. Department of Defense to announce that it would be "re-examining the military need" for continuing the program. As of 2008, there was no museum or monument dedicated to the accident in Palomares, and was noted only by a short street named "17 January 1966". Soil with radioactive contamination levels above 1.2 MBq/m2 was placed in 250-litre (66 U.S. gallon) drums and shipped to the Savannah River Plant in South Carolina for burial. A total of 2.2 hectares (5.4 acres) was decontaminated by this technique, producing 6,000 barrels. 17 hectares (42 acres) of land with lower levels of contamination were mixed to a depth of 30 centimetres (12 in) by harrowing and plowing. On rocky slopes with contamination above 120 kBq/m2, the soil was removed with hand tools and shipped to the U.S. in barrels. In 2004, a study revealed that there was still some significant contamination present in certain areas, and the Spanish government subsequently expropriated some plots of land which would otherwise have been slated for agriculture use or housing construction. On 11 October 2006, Reuters reported that higher than normal levels of radiation were detected in snails and other wildlife in the region, indicating there may still be dangerous amounts of radioactive material underground. The discovery occurred during an investigation being carried out by Spain's energy research agency CIEMAT and the U.S. Department of Energy. The U.S. and Spain agreed to share the cost of the initial investigation. In April 2008, CIEMAT announced they had found two trenches, totaling 2,000 cubic metres (71,000 cu ft), where the U.S. Army stored contaminated earth during the 1966 operations. The American government agreed in 2004 to pay for the decontamination of the grounds, and the cost of the removal and transportation of the contaminated earth has been estimated at $2 million. The trenches were found near the cemetery, where one of the nuclear devices was retrieved in 1966, and they were probably dug at the last moment by American troops before leaving Palomares. CIEMAT informed they expected to find remains of plutonium and americium once an exhaustive analysis of the earth had been carried out. In a conversation in December 2009, Spanish Foreign Minister Miguel Ángel Moratinos told the U.S. Secretary of State Hillary Clinton that he feared Spanish public opinion might turn against the U.S. once the results of the study on nuclear contamination were to be revealed. In August 2010, a Spanish government source revealed that the U.S. had stopped the annual payments it has made to Spain, as the bilateral agreement in force since the accident had expired the previous year. On 19 October 2015, Spain and the United States signed an agreement to further discuss the cleanup and removal of land contaminated with radioactivity. Under a statement of intent signed by Spanish Foreign Minister José Manuel García-Margallo and U.S. Secretary of State John Kerry, the two countries will negotiate a binding agreement to further restore and clear up the Palomares site and arrange for the disposal of the contaminated soil at an appropriate site in the U.S. The casings of two B28 nuclear bombs involved in the Palomares incident are on display at the National Museum of Nuclear Science & History in Albuquerque, New Mexico. The empty casings of two of the bombs involved in this incident are now on display in the National Museum of Nuclear Science & History in Albuquerque, New Mexico. While serving on the salvage ship USS Hoist during recovery operations, Navy diver Carl Brashear had his leg crushed in a deck accident and lost the lower part of his left leg. His story was the inspiration for the 2000 film Men of Honor. In March 2009, Time magazine identified the Palomares accident as one of the world's "worst nuclear disasters". There has been a marked long-term occurrence of cancer and other health defects among the surviving USAF personnel who were directed to the site in the days following the accident to clean up the contamination. Most of the afflicted personnel have had difficulty securing any type of compensation from the Department of Veterans Affairs due to the secretive nature of the cleanup operation and the Air Force's refusal to acknowledge that adequate safety measures to protect the first responders may not have been taken. In June 2016, The New York Times published an article on the 50th anniversary lingering legacy of the Palomares accident. The incident inspired the light-hearted 1966 film Finders Keepers, starring Cliff Richard backed by his band The Shadows. This incident was given the movie treatment in a semi-serious 1967 film, The Day the Fish Came Out, which covers the story of a plane crash alongside a Greek (not Spanish) Island and the surreptitious attempts by plainclothes U.S. Navy personnel to find the missing bombs. In November 1966, the plot of an episode of the espionage-themed American television series I Spy entitled "One of Our Bombs is Missing" was devoted to the search for an American Air Force plane carrying an atomic weapon which crashed over a remote Italian village. In Episode 12 of the fourth season of Archer, the main protagonists race against time to recover a lost hydrogen bomb near the Bermuda Triangle, with references being made to how the U.S. Air Force settled for "at least $20 million" when they lost a previous hydrogen bomb in the late 1960s. In 2000, the U.S. film Men of Honor focused on the life of the first black American master diver in the U.S. Navy. The film begins and ends with the Palomares bomb recovery by U.S. Navy personnel. In April 2015, the Palomares incident was mentioned in the Danish film The Idealist, a film about a similar incident, the 1968 Thule Air Base B-52 crash. In August 2015, the Palomares incident was the subject of a 2-minute animated film, made by Richard Neale, that was a finalist in the BBC's WellDoneU competition for amateur film makers. ^ a b c d e Hayes, Ron (17 January 2007). "H-bomb incident crippled pilot's career". Palm Beach Post. Archived from the original on 29 September 2007. Retrieved 5 October 2017. ^ a b c d e Long, Tony (17 January 2008). "Jan. 17, 1966: H-Bombs Rain Down on a Spanish Fishing Village". WIRED. Retrieved 16 February 2008. ^ a b c Moran, Barbara (Fall 2004). "The Day They Lost the H-bomb—and How They Got It Back". Invention & Technology. Archived from the original on 6 May 2006. Retrieved 5 October 2017. ^ a b c Megara, John. "Dropping Nuclear Bombs on Spain, The Palomares Accident of 1966 and the U.S. Airborne Alert" (PDF). Florida State University. Archived from the original (PDF) on 26 February 2008. Retrieved 17 February 2008. ^ a b c Lewis, Flora (1967). One of Our H-Bombs is Missing. McGraw-Hill. OCLC 784834. ^ Defense Nuclear Agency Kirtland AFB NM Technology and Analysis Directorate (15 January 1975). "Palomares Summary Report". Defense Technical Information Center. Archived from the original (PDF) on 24 June 2016. Retrieved 5 October 2017. ^ Staff (2003). "Broken Arrow". National Atomic Museum. Archived from the original on 16 February 2008. Retrieved 14 February 2008. ^ a b USAF Nuclear Safety, 1966. ^ a b c Moody, D. H. "40th Anniversary of Palomares" (PDF). Faceplate. Naval Sea Systems Command. Archived from the original (PDF) on 5 May 2009. Retrieved 15 April 2009. ^ Staff (9 August 2003). "Francisco Simó, 'Paco el de la bomba' de Palomares" (in Spanish). El País. Retrieved 24 May 2006. ^ Melson, June 1967, pp. 26–39. ^ Moran, Barbara (2009). The Day We Lost the H-Bomb: Cold War, Hot Nukes, and the Worst Nuclear Weapons Disaster in History. Random House, Inc. p. 95. ISBN 0-89141-904-7. ^ "USS Charles R. Ware DD-865". Danny Dannenfeldt, BM3. 2006. Archived from the original on 17 July 2011. Retrieved 10 September 2010. ^ NAVPERS-719 DECK LOG - REMARKS SHEET USS Forrestal CVA-59 dated Tuesday, 15 March 1966, 08-12 watch and 12-16 watch, and obtained from the National Archives and Records Administration in July 2015. ^ a b Melson, June 1967, p. 37. ^ Melson, June 1967, pp. 38–39. ^ "World News: US Navy Award for Decca". Flight International. Flightglobal/Archive. 11 May 1967. p. 728. Retrieved 8 July 2016. ^ Craven, John Piña (2001). The Silent War. Simon and Schuster. pp. 174–175. ISBN 978-0-684-87213-1. ^ "Francisco Simó, 'Paco el de la bomba' de Palomares". El País. 8 Sep 2003. Retrieved 7 November 2015. ^ Oskins, James C.; Maggelet, Michael H. (2008). Broken Arrow – The Declassified History of U.S. Nuclear Weapons Accidents. Lulu.com. ISBN 1-4357-0361-8. ^ a b Eisenbud, Merril; Gesell, Thomas F. (1997). Environmental radioactivity: from natural, industrial and military sources. Academic Press. p. 429. ISBN 0-12-235154-1. ^ a b c d Stiles, David (2006). "A Fusion Bomb over Andalucia: U.S. Information Policy and the 1966 Palomares Incident" (PDF). Journal of Cold War Studies. 8 (1): 49–67. doi:10.1162/152039706775212067. Archived from the original (PDF) on 31 October 2008. Retrieved 21 October 2008. ^ a b c Geitner, Paul (11 September 2008). "Spanish Town Struggles to Forget Its Moment on the Brink of a Nuclear Cataclysm". The New York Times. Retrieved 5 November 2008. ^ a b Bejarano, José (19 November 2004). La maldición de Palomares (in Spanish). La Vanguardia. Archived from the original on 5 July 2007. Retrieved 31 May 2007. ^ "The Duchess of Medina Sidonia: Aristocrat whose radicalism earned her the title 'Red Duchess'". The Independent. 17 March 2008. ^ "Spain bans overflying by NATO". The Times. London. 22 January 1966. col A, p. 8. ^ Finney, John W. (28 February 1968). "U.S. Reviews Need for H-Bomb Alert". New York Times. p. 1. ^ Méndez, Rafael (10 December 2010). "Palomares: 50.000 metros contaminados con plutonio". EL Pais. El Ciemat comenzó a realizar un detallado estudio tridimensional de la contaminación: expropió los terrenos de las bombas, tomó 325.000 muestras con un georradar en 6,6 millones de metros cuadrados de suelo y analizó 1.848 muestras de tierra. En un informe preliminar, de junio de 2007, el Ciemat admitió que había contaminación fuera de las zonas valladas y expropiadas y el CSN replicó que la contaminación detectada se podría superar la dosis de radiación admisible para el público, lo que obligó a "imponer restricciones totales o parciales" al uso del suelo. ^ Méndez, Rafael (10 April 2008). "España halla las zanjas radiactivas que EE UU ocultó en Palomares" (in Spanish). El País. Archived from the original on 12 May 2008. Retrieved 12 April 2008. ^ h.b. (10 April 2008). "Spain finds trenches of radioactive earth buried at Palomares". typicallyspanish.com. Archived from the original on 12 April 2008. Retrieved 12 April 2008. ^ "US ends payments to Spain for 1966 bomb accident". Google News. AFP. 23 August 2010. Retrieved 10 September 2010. 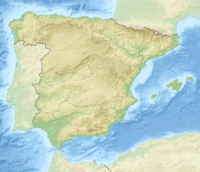 ^ "Spain, US sign new accord to study further cleanup work after 1966 nuclear accident". US News. AP. 19 October 2015. Retrieved 19 October 2015. ^ Dorsey, Jack; Washington, Jim (26 July 2006). "Pioneering Navy diver Carl Brashear dies in Portsmouth". The Virginian-Pilot. Archived from the original on 5 February 2008. Retrieved 19 February 2008. ^ "The Worst Nuclear Disasters". Time. 2016. Retrieved 8 July 2016. ^ Philipps, Dave (19 June 2016). "Decades Later, Sickness Among Airmen After a Hydrogen Bomb Accident". The New York Times. Retrieved 19 June 2016. ^ Minder, Raphael (20 June 2016). "Even Without Detonation, 4 Hydrogen Bombs From '66 Scar Spanish Villag". The New York Times. Retrieved 29 March 2017. ^ Jones, Jae (5 January 2016). "Carl Maxie Brashear: First African American U.S. Navy Master Diver". Black Then. Retrieved 29 March 2017. ^ "Well Done U". BBC. 16 October 2015. Retrieved 8 July 2016. "Broken Arrow – Palomares, Spain" (PDF). USAF Nuclear Safety. Directorate of Nuclear Safety, United States Air Force. 52. Sep–Oct 1966. Archived from the original (PDF) on 27 March 2009. Retrieved 23 March 2009. Lewis, Flora (1987). One of Our H-Bombs is Missing. Bantam. ISBN 978-0-553-26483-8. Maggelet, Michael H.; James C. Oskins (2008). Broken Arrow- The Declassified History of U.S. Nuclear Weapons Accidents. Bantam. ISBN 978-1-4357-0361-2. "Broken Arrows: The Palomares and Thule Accidents". Brookings Institution. 1998. Archived from the original on 9 November 2009. Retrieved 16 November 2009. Wikimedia Commons has media related to 1966 Palomares B-52 crash. John Howard, "Palomares Bajo", Southern Spaces, 23 August 2011.
n-tv: Atomkatastrophe von 1966 – USA und Spanien entseuchen. Oral history of Willard Franklyn Searle recounting the recovery project.